New York, NY – December 20, 2017. Ron Gordon Watch Repair, a top-rated Omega watch repair service for NY, New York, is proud to announce a new blog post on a truly exciting watch, the forthcoming Omega Speedmaster Grey Side of the Moon ‘Porsche Club of America’ limited edition watch. As New York City’s premier watch repair shop for Omega watches, Ron Gordon Watch Repair is passionate about everything dealing with the Omega watch brand. To read the new blog post on Omega watches, visit https://www.rongordonwatches.com/2017/12/omega-speedmaster-admiring-repairing-legendary-watch-new-york-ny/. The post has links to more detailed new coverage of the watch and a discussion of some of its key features. Interestingly, many people own “historic” Omega watches already and have found Ron Gordon Watch Repair to be one of the best, if not the best, places to get an Omega watch repaired in the New York City area. Persons who’d like to explore Omega watch repair services, should visit https://www.rongordonwatches.com/omega-watch/. Ron Gordon Watch Repair has established a reputation as the best place in New York to get an Omega watch repaired. Many customers bring their Omega watches into Ron Gordon as they come into New York City for work, as the Shop is conveniently located near Grand Central Station in Midtown. The blog post situates this new Omega watch within the rubric of art, New York City, and a passion for excellence. Let’s face it. A car of any type – much less a Porsche – isn’t exactly a practical decision in New York City, a city in which the subway can often be faster than a vehicle of any type. In addition, many New Yorkers who are affluent enough to own a Porsche might also be garaging that car not in the City but elsewhere like their vacation home in the Hampton’s. It’s not about practicality, after all. But to confuse and see a contradiction between “art” and “practicality” or between “fast cars” and “cool watches” is to miss the point. The reason someone is willing to shell out thousands of dollars for an Omega watch is as much about art or style as about substance. After all an Apple watch, or a Timex for that matter, can effectively keep the time, just as a Ford or a Chevy can effectively be a form of transportation (not to mention using the New York City subway). 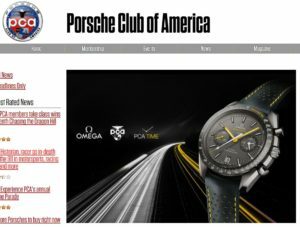 The post thus explores and explains this incredible partnership between the Porsche Club of America and Omega Watches, focusing on the brand affinity between “fast cars” and “cool watches.” Readers are advised to act fast, however, as this is a limited edition watch of only 99 watches and rumor has it that there are just a few left, if any.